Author of The Big Shift: Rethinking Money, Tax, Welfare and Governance for the Next Economic System. Which do you fancy – Economic Growth or Financial Collapse? I have now watched a TED talk on this topic twice and can’t help but respond. Ecological economist Marjan Van Den Belt is right when she says “we are mindlessly addicted to economic growth, we are growth junkies.” She advocates reciprocity in economies and says that is the key to a circular, sharing, regenerative economy. So far so good. She urges listeners to take “a small step in the right direction”. She points out that goal 8 of the UN Sustainable Development Goals is “meaningful jobs and economic growth”. What a shame they the UN doesn’t appear to understand that growth measures both good and the bad and doesn’t distinguish between them. So every time someone gets lung cancer that is good for growth, and when there is an accident the same. But when a mother cares for her preschoolers well or a family member cares for a frail older relative, the GDP doesn’t budge. Family work, voluntary work are not counted. She also says neoclassical economic theory describes people as homo economicus – rational, self-centred and suggests trying to put that on your profile for a singles site. Yes. So why do I want to respond? Because we are trapped. We have designed the money system and the land tenure system and together they are leading us by the nose to the growth imperative. And what happens if the economy doesn’t grow? Why it collapses of course. So is this economics professor really suggesting we crash the money system by allowing economic growth to grind to a halt? Does she really want us to have no money in the system, to have ATM machines that don’t work, to have plummeting house prices with negative equity and all the ensuing misery of foreclosures and bankruptcies? I doubt it. Yes she wants a new paradigm and quotes Buckminster Fuller’s exhortation to build a new model. Good. That is exactly what I have done in my new book The Big Shift. Although there may be other possible ways to get there, together in our little new economics think tank we designed this new model and believe once it is built and once it flourishes it will provide not only appropriate jobs, but where jobs are not possible, it will give a basic income so that parenting, inventing, producing needed sustainable energy and products will also flourish. You see we need to get back to community owned land and community created and designed money systems. I know it is a huge leap for our thinking to get to community owned land and we can only do this fairly by adequately compensating landowners for their land. We can only do this by creating new money because there isn’t enough in the system of the conventional debt-based money created by banks. Today I had a lovely email from a Green Party activist who said, “I have spent the weekend reading your book, couldn’t put it down. All amazing and well outlined ways to change our world small sections at a time. However, are there enough of us who are willing to take that last step?” And she wanted to buy a second copy to lend out to friends. Nice. And she wanted to buy a second copy to lend out to friends. Nice. For those wanting to read more about how neoclassical economics started and why, I suggest reading The Corruption of Economics by Mason Gaffney and Fred Harrison. It outlines how neoclassical economics started as a reaction to the influence of Henry George. Land barons, industrialists and bankers paid scholars to corrupt the discipline. After two decades they had succeeded in getting any mention of land, banks, money or credit in the mainstream texts. They had subsumed land under capital so successfully that even forward thinking economists like Gareth Morgan fail to mention land as a separate factor of production. Moreoever he also fails to mention money creation. This emphasis on pointing out the fallacies of measuring the economy as the growth in GDP has gone on since the 1970s so it is great that more know about it But they don’t know what causes the growth imperative, which, as Steve Keen has pointed out, is the combination of the tax system that fails to address rises in land value (and other assets) and the faulty money system. Author Deirdre kentPosted on July 3, 2017 July 3, 2018 Categories currency design, land rent, land tenureTags economic growth, financial collapse, growth imperative, Marjan Van Den BeltLeave a comment on Which do you fancy – Economic Growth or Financial Collapse? 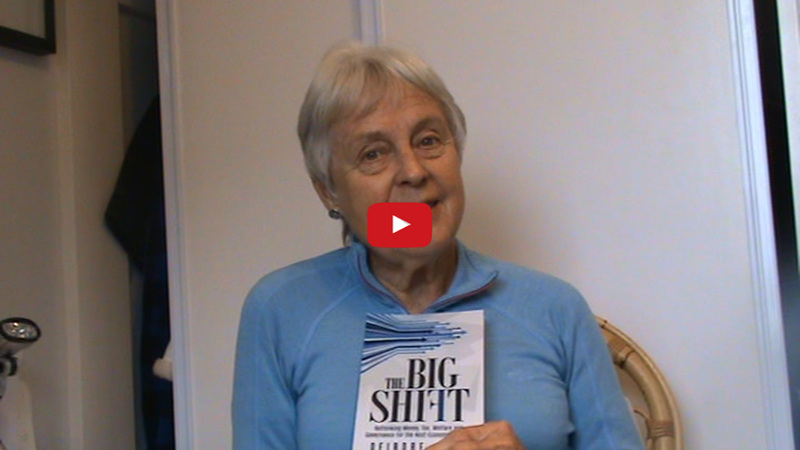 Buy The Big Shift Book! The Big Shift on Kindle! Deirdre Kent is a New Zealand researcher and activist. Read Deirdre's Bio. or send an Email on the contact page.